Bathroom remodeling trends reflect a growing desire for a contemporary look with a spa-like feel. Bathroom designers and homeowners are embracing a more open space with a clean, minimalist appearance. Bathroom design is incorporating many natural elements, among other things. Here are 5 hot trends happening in bathroom design today. Custom showers have quickly become a main focus in bathroom remodeling projects. Homeowners are seeking to create a spacious area with low or no threshold, allowing the tiles to flow seamlessly into the rest of the room. Added features like benches are also popular. 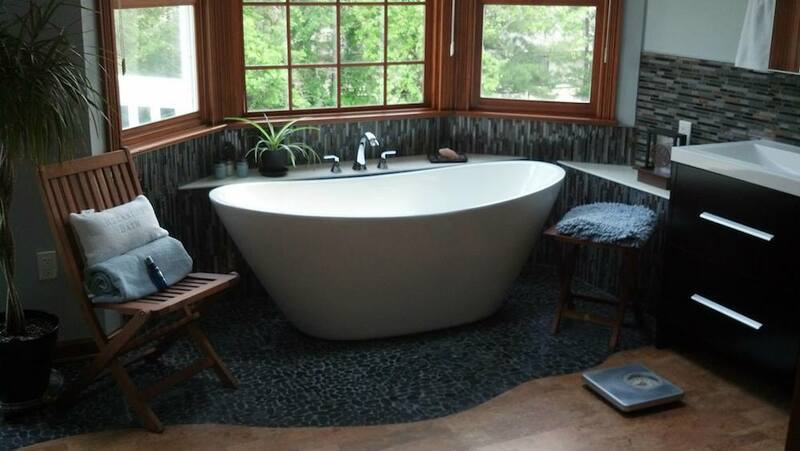 For many years, a bathtub or jetted tub was a must on most homeowner’s wish lists. Today, many are opting for the sleek look of a freestanding tub, if any at all. A classic claw footed tub is still in style, creating a focal point for the room. In keeping with the modern minimalist feel, materials and colors are trending towards natural tones. From warm wood grains to glass tiles, outdoor elements are being brought into the bathroom in order to create a zen-like atmosphere that allows for ultimate relaxation. Homeowners are seeking to reduce their consumption of water, so efficient faucets and fixtures are in demand. With multiple shower heads and double sinks quickly becoming the norm, it makes sense to use more eco-friendly fixtures. Vanities that look like a freestanding piece of furniture are increasingly popular. In fact, shelving and other storage units that are not built in are in demand. Freestanding pieces offer flexibility and allow homeowners to maximize the open space in a room. For homeowners seeking a fresh look, our Columbus Ohio bathroom remodeling experts can get you started on the path to create a space with a whole new feel. Transform your bathroom into a relaxing retreat and embrace a modern design that will provide efficiency and style for many years to come. satisfied to search out so many helpful information here within the publish, we need develop extra techniques in this regard, thank you for sharing.